Anyone with a valid full driving licence is welcome to take part. Do I need some sort of competition licence ? Events are run under an independent organisation, a competition licence can be purchased for £5 for the day or £15 for the year. An MSA competition licence is not required or valid for our events. Yes you will need to wear a helmet during the event, open top vehicles are full face only whereas closed roof vehicles can be either full or open face. Helmets are checked during scrutineering, we specify that they must be in a good safe condition and suitable for the activity. We do not enforce any one particular standard as there are a lot to choose from and it confuses the issue, if you are unsure then please ask before the event. What if I’ve never done any motorsport before? The diverse nature of the competition means the experience is as intense or as casual as you decide to make it for yourself. Whether you want to compete with the big boys at the front or simply want to have some fun in your road car you’ll find there is always someone in the same position as you. We have tried to arrange the class structure so that there is always someone in a similar position as you to compete against. All vehicles are welcome to enter (subject to organiser approval), just so long as they meet safety and noise emission requirements. It is a requirement that all vehicles pass a static noise test of 105dba and the corresponding driveby. As a general rule, your car needs to be up to at least MOT safety standards, should be in good condition and well serviced. All vehicles will be scrutineered before signing on to check they are safe and mechanically sound, safety is paramount so please ensure you meet these standards. It depends on the class and type of vehicle. Convertible and open top vehicles in any class must have sufficient practical roll over protection in the form of roll hoops, roll bar, roll cage or be fitted with a hardtop. Standard roll over protection is rarely sufficient on production vehicles with the exception of a hardtop. Vehicles in the higher classes must be fitted with a roll cage/roll bar or roll hoop in the case of single seater type vehicles. Vehicles in lower classes are not required to be fitted with a roll cage but it is strongly recommended as most vehicles in this class would fall under the classification of trackday cars so the extra protection would be a wise investment. There will be a wide range of vehicles ranging from cutting edge competition vehicles to small engined superminis so no matter what vehicle you have there should always be someone you can have a battle with. 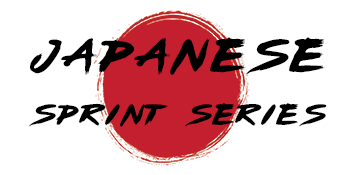 The Japanese Sprint Series welcomes all entrants, whether for the whole season or the odd round. Entries are made on a round by round basis so you only need commit to the events that you want to do but that may impact on your championship standings at the end of the year. There may also be some additional individual sprint events available throughout the year that are their own competition and do not count towards any championship. 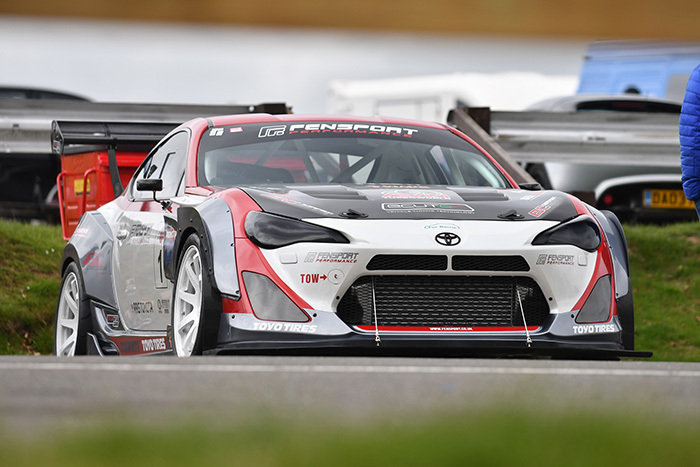 In order to score points towards the championship in the Japanese Sprint Series yu will nee dto register for the championship, the same applies tot he other series that run within the main series. Firstly, the amount you spend on your car is up to you. We usually run tracks of somewhere between 1.2 - 2 miles depending on the venue, and schedules should allow for 1 practice run and up to 6 timed runs to be completed but this is obviously dependent on any delays being caused throughout the day - so factor your fuel usage in to that cost. Fees wise, the cost of each round is £139-179 per driver and you pay on a round by round basis, you may also need to factor in your competition licence or helmet hire if you do not have those things already. 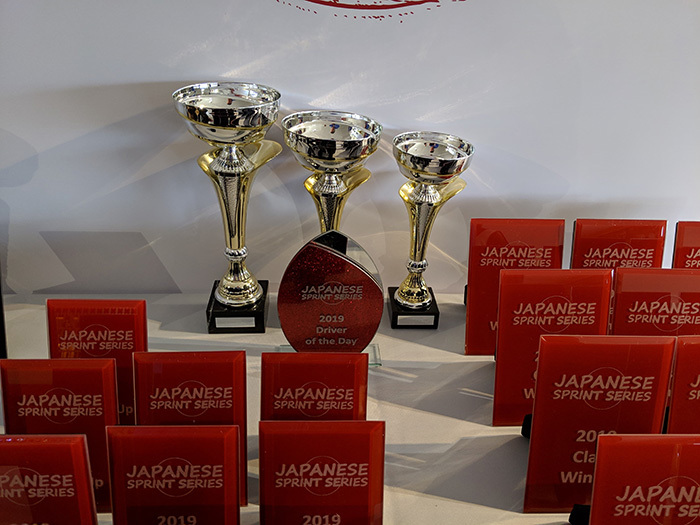 For each round of the Japanese Sprint Series trophies are awarded for 1st, 2nd & 3rd overall, each individual class winner will get a trophy providing there is more than one entrant in that class and if there are enough entrants in a class the runner up will also receive a trophy. Entrants into one of the sub-series that run within the main series are competing for additional similar trophies but they have their own class structure and are awarded at the end of the year rather than per round. You can share your car with another driver if you wish but you will need to enter both drivers as separate entries. The schedule means that it is not practical to share a vehicle between more than 3 drivers as there would not be enough time for each driver to complete their runs without disrupting the day overall. Scutineering & Signing on - Get the car checked over and drivers signed on for the event. Timed Runs - All competitors take part in up to 6 timed runs which determine the results for the day. Sprint events are a full day affair so you can expect to be at the venue from approximately 07:30-17:30. Events will start with a scrutineering and signing on period followed by a safety briefing at around 8:45 and then sighting laps with the first run starting around 9:30. Runs are completed in order so all competitors will complete run 1 before moving onto run 2, etc. Runs will always cease by 17:00 (if they haven't already been completed) and the awards presentation will take place. Entries need to be made by Midnight on the Tuesday before each event so that we can finalise entry lists, etc. Entries at the Book Early Price will last until one week before the event closes at which time the price will increase by £20 per entry. This is to encourage people to enter in good time as experience tells us that most people like to leave it until late, similar events require you to commit to several events at a time or enter several weeks in advance so rather than closing entries much earlier we will impose a financial incentive to encourage earlier entry. You are required to display competition numbers on the side of your vehicle throughout the event, these will be allocated and provided for you on the day in the form of 25cm x 30cm door plates. It is required that these are displayed as supplied throughout the event, if you do not wish to attach stickers to your vehicle then we advise you mount them on a magnetic backing so you can easily remove them after the event is concluded. If you have entered into one of the sub-series that run within the Japanese series then you may be issued with sponsor stickers that you are requried to display as well. You can do if you want to but we only require that you wear normal clothes that cover your arms and legs unless you are in a class where flameproof overalls are required, we do however encourage you to be as safe as possible so we would recommend the use of flameproof overalls to all particiaptants. You will need your arms and legs covered at all times in the vehicle and we advise that if you are wearing regular clothes then you avoid synthetic fabrics as in the unlikely event of a fire they will melt onto the skin rather than burn away. Spectators are welcome to attend and there is no fee to do so however anyone under 16 must be accompanied by an adult at all times and pets are not permitted on any of the venues under any circumstances. The circuit venues will usually have spectator facilities in place so you can view from several areas but some of the venues i.e. Kendrew Barracks, Blyton Park will generally just have the one area available. Please note that animals and drones are not permitted at any venue. Kendrew Barracks is still an MOD facility and everyone attending that event is required to submit their details before the event in order to gain entry to the venue. Do I need to enter the championship ? To qualify for championship points in the Japanese Sprint Series you need to register and pay a small fee, however you will need to have competed in at least 3 rounds to qualify for a trophy at the end of the year. What awards are there at the end of the year ? We award trophies for the top 3 overall in the series followed by a trophy for each individual class winner, 2nd in class will recieve a trophy if there are 4+ in the class and 3rd in class will get a trophy if there are are 6+ in the class. How are the points calculated ? Points are awarded based on your overall finishing position on the event with 100 points for 1st overall, 99 for 2nd, 98 for 3rd, etc. You must be registered to score championship points. Do we get any bonus points ? Not in the Japanese Sprint Series, we did have that in previous years in our other series but in practice it made no difference at all. When do we get our trophies ? There is an awards presentation at the end of each event and then at the final round there will be the championship awards presented shortly after the event awards. You will need to attend the awards presentation to collect your trophy, they will not be available after the event. Can I drop scores ? Your final championship postition is calculated using your best 6 scores so if you were to take part in the entire series then you would be able to drop one score.